The world’s most powerful four cylinder engine in the 2014 Mercedes-Benz CLA45 AMG is even faster than preliminary estimates. Mercedes-AMG is testing all their cars out at Willow Springs International Raceway this week for the Best of AMG event, and the CLA45 AMG is faster than originally estimated. It’s just one more reason to get excited for the November launch of the CLA45 from AMG. Mercedes-AMG tells us that the new CLA muscle car will launch from 0-60 mph is just 4.4 seconds, beating preliminary estimates. It’s just one tenth of a second faster than the 4.5 second sprint time estimate, but when it comes to performance, that’s a big deal. We also know it has an electronically limited top speed of 155 mph. The Mercedes CLA45 AMG cars will see cornering speeds on the track range from about 70 mph to over 170 mph, with straightaway speeds nearing 200 mph possible. There isn’t a better place on the planet to put the AMG performance to the test. It should be an exciting week as all 20 AMG cars take to the fastest road circuit in the U.S. The new CLA45 AMG is coming with some exciting new performance technology. The small displacement 2.0-liter AMG engine acts much bigger than anyone would expect and gets a twin-scroll turbocharger, an AMG performance exhaust system, and a high-performance cooling system. The 2.0-liter engine comes mated to an AMG Speedshift DCT seven-speed sports automatic that transfers the power to all four-wheels. 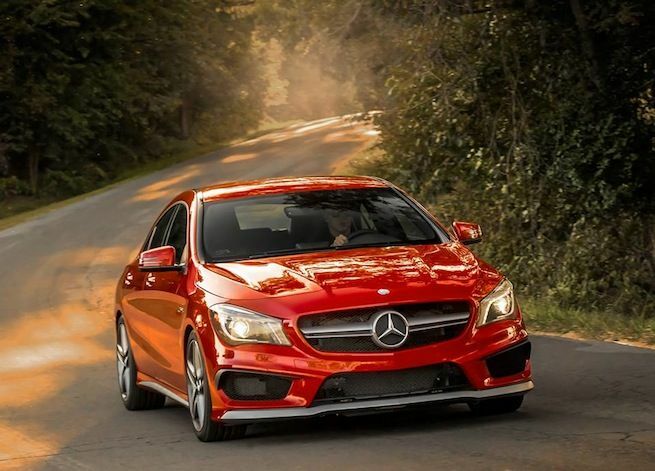 The all-new 2014 Mercedes-Benz CLA45 AMG offers driving performance in a new mid-range compact segment at its very best. The new four-door coupe will see the first U.S. deliveries beginning in November 2013. Pricing for the CLA45 AMG has been announced and will start at $47,450. Mercedes should attract a new generation of performance buyers with the new CLA-Class.